Nitric Oxide Product Review: NaNO Vapor & Fierce Show Real Value! The latest reviews are in and there is good news! See how MuscleTech NaNO Vapor & S.A.N. Fierce stack up in this reviewer's opinion. Learn more from the following two reviews. Warning: Do Not Exceed Recommended Dosage. Ever. 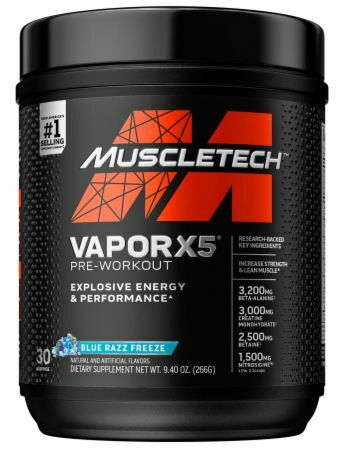 MuscleTech claims NaNO Vapor to be "[One Of The Best] Vaso-Anabolic Psychoactive Experience!" MuscleTech has ALWAYS relied heavily on marketing to popularize their supplements and that approach has certainly worked for them over the years. I originally purchased both Cell-Tech and Nitro-Tech in the fall of 2000 after reading one of their six-page advertisement campaigns in FLEX magazine. While there may be more diversity among creatine products, protein products offer less variability and to expressly purchase a protein powder on name brand alone seems very silly to me now. After all, 30 grams of protein is always going to be 30 grams of protein for the most part. Some blends may be slightly better than others, but the basics are the basics. NaNO Vapor offers more advertising hype from MuscleTech, and the question on my mind is whether or not it truly delivers. I tried one sample of NaNO Vapor in the fruit punch flavor. It also can be purchased in blue raspberry fusion and orange haze flavors, both of which sound interesting. Right off the bat, I can say I did not like the taste! I'm not sure if it was too much powder mixed with not enough water, but I definitely found it too strong and ill tasting. It was almost difficult for me to finish in fact, but I managed to do it. It was similar to other NO products I've tried in terms of taste and it mixed well in water. I definitely do not enjoy the taste of almost any NO product, although NO-Xplode by BSN was one which I can say I actually did enjoy. Most of them are difficult to consume. A 5-In-1 Pre-Workout Formula Designed To Enhance Muscle Strength And Recovery. * A Complete Pre-Workout Crafted to Deliver Unparalleled Energy, Muscle Pumps, and Performance. * Go Now! I used NaNO Vapor on leg day and it had been a LONG time since I had a leg day - probably six weeks actually! It was not very cool that I went so long without training legs, but it so happened to work out that way and there was nothing I could do but to face a heavy leg training day and hopefully be more consistent in the future. I can say that I had a great workout, finishing off with leg extensions using the whole stack and doing a dropset from there. I found my strength to be quite acceptable and my pump was very good. Given that my diet was not particularly good that day, I have to say that I was impressed with my overall result for the day. Both myself and my training partner agree that what should have been an average or below average workout was definitely above average. Maybe not the single best workout ever, but everything considered, things were better than usual and since the only extraneous variable for the day was the use of NaNO Vapor taken 15 minutes pre-workout, I can safely say that this product appears to be effective. I will use it more in my workouts. Right now I can say that I recommend this product and it seems to do what it says. 2.11 lbs (40 servings) for $44.99 (check below) sounds like a good deal to me too! I got my samples of Fierce by S.A.N nutrition at the 2007 Mr. Olympia weekend in Las Vegas. My experience there was incredible and I got more review material there than I ever got anywhere before. I am always eager to try out new NO products since they give a psychological edge that truly does intensify workouts. When I have such an edge, I feel more motivated than ever to have a strong workout and beyond that, I feel motivated to eat a proper diet, rest accordingly, and follow all other aspects related to making consistent gains in bodybuilding. So while NO products may not exactly be anabolic like supplements such as creatine, they give a psychological edge which manifests in all other areas of bodybuilding - at least for me. This is the category where I find that just about every NO product fails miserably in. The reality is that NO products are not meant to be taken in a drink formula! It seems convenient, mainly because NO pills are very big - generally around the same size as large antibiotic pills also known as "horse pills". Not only that, it is usually required that three of those large pills are consumed as one pre-workout dose, and it is also recommended to take as many of three doses per day! That is a lot to swallow (literally) and I can see where the demand for NO drink mixes come in, but I have yet to try an NO product which I actually enjoyed drinking other than NO-Xplode. Most of them are quite horrible tasting and almost reprehensible to taste even. Fierce by S.A.N. was not great tasting by any means, but not as bad tasting as some of the other NO products I've tried, such as Fast Twitch by CytoSport. Fierce by S.A.N. is slightly above average as far as NO products go when it comes to taste but that really isn't saying much since they are almost all torturous to drink. Pre-Workout Supercharges Your Training. * Promotes Endurance, Raw Strength, Powerful Energy! * Go Now! I had a very good workout using Fierce by S.A.N. The pump was pretty good and I lifted a good amount of weight during my workout. I went up to 745 pounds on the leg press for reps using very good form. My goal is to lift 1,000 pounds for reps with good form on this exercise, which is a pretty solid lift. I only did leg presses and leg extensions during my workout, finishing off with a drop set on the leg extension machine. I had previously performed reps using the entire stack on the leg extension machine. Overall this was a very good NO product and I will definitely use it again. It wasn't as bad tasting as other NO products, and offers a lot in its matrix other than simply NO. It delivers what it promises and I will probably always use NO products in my workouts, if not every workout, at least in any workout that I want to rip the head off of! They always help me to achieve my maximum intensity as well as awesome pumps. 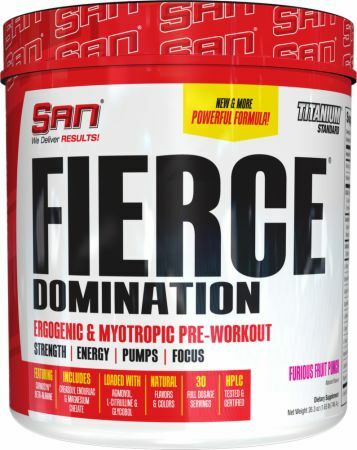 I would recommend Fierce by S.A.N for anyone who likes to try a variety of NO products or for anyone who is looking for NO mixed with other bodybuilding ingredients as well.